This thermally broken frame and sash offers excellent thermal performance and demonstrates the dual colour capability of the Designer Series ThermalHeart™ range. The frame and sash set the theme for a flat faced, square edged aesthetic common to all Designer Series products. Window mullions have internal stiffening boxes rather than external fins to also improve aesthetics. Thermal Heart™ windows and door frames have been designed in Australia to suit our building-in conditions. Nailing fins (weather bars), building-in lugs and the PVC sill flap are all designed in to make it easier for your builder. Many imported windows have been designed for overseas conditions and don’t necessarily suit Australia. Series 726 incorporates Thermal Heart™ technology giving a true wide thermal break between the outside and inside faces. WERS(Window ENERGY Rating System) data shows that using the same IGU in a Thermal Heart™ awning window is 32% more efficient than a standard non- thermally broken window. A major advantage with Thermal Heart™ in cold climates is the reduction in internal condensation. Thermal Heart™ is also suitable for hot climates providing extrAinsulation to reduce requirements for home cooling. We offer Thermal Heart™ in a range of stocked colours including dual colour ClearMIST™ contact us for details. 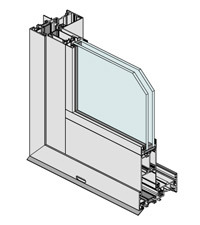 The extra strong sash allows large sash windows to be fabricated for high wind load areas. The bold clean frame gives a contemporary appearance with sharp square external glazing beads are standard. Awning sashes can be fitted with cam handles, manual chain winders or concealed electric winders. The winder options suit fixed fly screen installation. The window is compatible (appearance, strength and performance) with the high performance Thermal Heart™ hinged, sliding and bi-fold doors.